Once in a while, wouldn’t it be nice if there was a way to publish a piece of stunning content without writing it from scratch? You’re in luck, content marketer, there is. But wait … No doubt right about now you’re wondering if I’m depriving some village of their idiot. If maybe I hit bottom and kept digging? If maybe I’m about to introduce you to the content creation version of the ShamWow? Relax. What I’m saying is completely achievable. It’s called republishing. Republishing is the process of updating and polishing an old article — and then publishing it on a new date. That’s it. It’s something we do here at Copyblogger. It isn’t necessarily an easy publishing option either, if you want to do it right. Dedicating time and effort to republishing benefits your content marketing efforts in several ways. Today we’re going to explore five, as well as the steps to take to republish your own content. When you update and republish a piece of content from the past that your audience enjoyed, your current audience gets a chance to consume and enjoy this content as if it were new. For instance, excellent articles Brian Clark wrote back in 2007 can be updated and shared with the much larger audience Copyblogger has today. Here’s one of those positive effects: because the URL stays the same, republished content gets a new chance to earn more links and social shares. We all know that content receives the bulk of links and social signals during the first week after it’s published. Over time, the number of new links and social shares drops dramatically. But when you update an old article and then republish it, the new audience you expose it to initiates a new round of linking and sharing (check out number four below to see what I mean). So even if the original article was published four years ago, a republished article that has been upgraded with recent information will appear higher in search engine rankings simply because of the surprising effect of freshness. If you would like to learn a few more reasons why Google loves republished content, watch this nine-minute video by Rand Fishkin. Let’s look at one of my past articles on Copyblogger: Master This Copywriting Formula to Dominate Any Social Media Platform. The headline taps into a meaningful, big promise (dominate). The headline is also conditional (you cannot cash in on the promise unless you do something). I’ve since used a similar headline to test my hunch that this is a strong headline style that inspires social shares. If you look at the social share numbers for Master This Storytelling Technique to Create an Irresistible Content Series, you’ll see I think I’m onto something. Republishing an old article with this headline style will allow me to test it in a new way. Will I be able to double or triple the social shares on an old article with a new headline that matches this style? You can record an article’s social-share numbers and then monitor how your current audience responds to the optimized, republished version of the article. Finally, as writers, we get better at what we do over time. As you write more and more, your newer posts will be better than your older ones. Yet, there might be some gems in your archives that, with a rewrite, could look as good as the newer ones. So, why not review your archives and single out some of your favorites? Then, schedule them into your content publishing calendar. 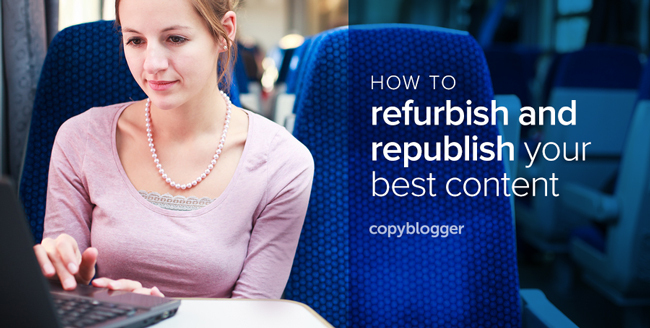 You’ll give new life to old content — and potentially republish a hit. But there is a very specific way in which you must do that. Let me show you. We’ll look at an article I wrote on my blog, The Copybot, titled “Starting a New Blog? Assume Nothing” as an example, and I’m going to go through the steps of republishing it. This is what it looks like from inside the Rainmaker Platform. And then enter the current date (November 4, 2015, for this example). When you go to the front page of The Copybot, you will see the post at the top with the new publish date. Voilà. We recommend you create a list of articles you’d like to update and republish some day. We keep a list of classic Copyblogger posts in a Google Doc. For each classic article, we make a note of the headline and URL. What exactly should you refresh? Republishing is not a new practice. Both print and digital publications regularly republish old content. They called this “Refreshing the evergreen.” Here, they updated their articles and didn’t add notes explaining the articles were old content being republished. Edit the text to be up-to-date and accurate. Change the headline if the previous headline didn’t work well. Present new ideas or opinions. Rewrite sections that are bland. At Copyblogger, we also recommend that you add an image or update the current image if you can find a better choice to complement your article. And there you have it. A simple way to create tantalizing, potentially hit content without starting from scratch … you might even have a little extra time to take a breather. Or if you’re like me, wash and dry your car for the third time this week with your new ShamWow!